Füri, E. ; Deloule, E. ; Dalou, C.
Chondritic meteorites preserve extreme intra-sample 15N/14N variations, which exceed, in some cases, the range of nitrogen isotope ratios observed at the Solar System scale. These observations are based on in situ analyses of CN− molecular ions by secondary ionization mass spectrometry (SIMS) in carbon-rich phases. The distribution of nitrogen and its isotopes in silicate minerals and glasses has not been investigated to this date due to the lack of an appropriate analytical protocol, as well as of suitable N-bearing standards. In order to improve our knowledge of the nitrogen signature of both extraterrestrial and terrestrial silicate samples, we have developed a protocol for determining precise and accurate nitrogen abundances (and isotope ratios) in basaltic glasses using high mass resolution SIMS. Twelve (C-)N-bearing synthetic basaltic glasses, containing between<1 and 18,443 ± 966 ppm N, form the suite of reference materials for this study. By targeting the CN−, NO−, AlN−, and SiN− secondary molecular ions, nitrogen abundances can be detected down to the ppm level in both carbonbearing and carbon-free glasses. 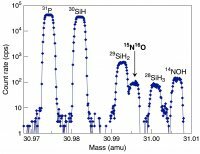 The analytical precision and reproducibility of isotope ratios in the form of 15N16O−/14N16O− is on the order of 11‰ and 10 to 17‰ (2σ), respectively, for reference glasses containing ≥100 ppm N. Thus, nitrogen isotope ratios can be determined with an uncertainty that is small enough to resolve nitrogen isotope variations in extraterrestrial silicates. The study of four chondrules of the ordinary chondrite Semarkona (LL3.0) reveals that the nitrogen distribution in the mesostasis is highly heterogeneous, with concentrations ranging from 0 to 1099 ± 168 ppm. The δ15N values in mesostasis, olivine, and pyroxene vary between −36 ± 50‰ and +55 ± 72‰, indicating that silicate phases in chondrules do not host particularly 15N-poor nitrogen.